[FIX] An Unexpected Error Has Occurred. The Troubleshooting Wizard Can’t Continue. This article will help you to fix "An unexpected error has occurred. 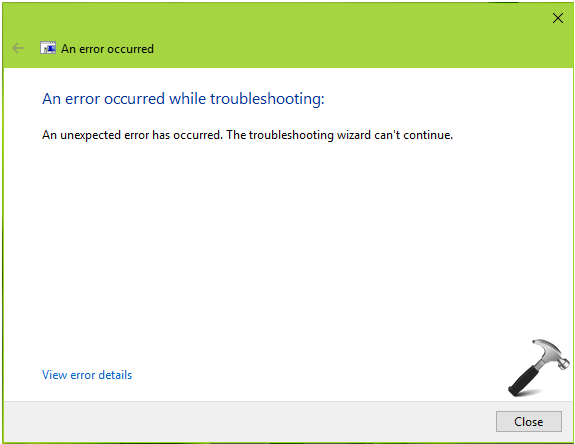 The troubleshooting wizard can't continue." message for troubleshooters in Windows 10. Once you set these services to their correct Startup type and running Status, close Services and make a reboot. After restating machine, you should be able to use troubleshooters without any error. 3. Right click on ScriptedDiagnostics registry key and select Delete and confirm the operation on prompt. 4. Similarly delete ScriptedDiagnosticsProvider registry key (HKEY_LOCAL_MACHINE\SOFTWARE\Policies\Microsoft\Windows\ScriptedDiagnosticsProvider), which is located just below ScriptedDiagnostic registry key you deleted in previous step. Close Registry Editor and reboot to make changes effective. The issue should no longer persist after your restart your computer. I cannot get to the search box on computer to try and fix resources problem, when I click OK, it brings me back to the same screen. Diagnostic services were configured correctly and there were no such keys to delete in the registry so this was not a fix for me. Diagnostic System Host is not running, Startup Type is Manual. Could you advise me how to set it running? ^^ Click on the ‘Start’ button on the service property sheet (double click on service to get this). ‘Start’ button for wdisystemhost is greyed out and unavailable. Win 10 Build 1709. I have the same problem and I cant find the Scripted Diagnostics or Scripted Diagnostics Provider registry key in the registry editor, so I can delete it. Now what?? ^^ Have you tried FIX 1? Please advise something other than the above ´solutions´ that do not exist in the registry. Also the Microsoft’s Virtual Agent has a broken link when trying to use the “Fix It” Live link to fix error 0x8000FFFF…??? Was finally able to download the Microsoft “Fix It” for Hardware & Devices which worked one time and the error was gone, but for some reason the next day the error 0x8000FFFF returned again and not sure why. I hope I can eventually fix this problem or a get a possible update? Mak, I know how you feel my new computer and windows 10 has made me so stressed I wish I could return the whole thing. Hard to understand how things have become much more difficult with something newer. 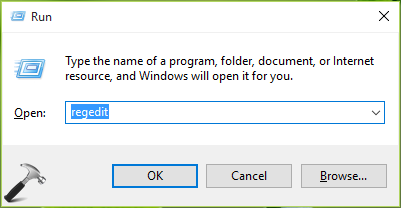 Should not the whole point be to make things simple for those of us who want to USE the computer not try and get into files and fix things all day? Nothing seems to be right with my new windows 10 I am going to have to pay to have someone else mess with it I am to old and to stressed. CMD does not have admin privelege. Trying to fix : using W10 troubleshooting this error came about and googled your page. Fix #1 services.msc conforms exactly same status. I’ve had previous issues with Troubleshooter in Win 10, and used this method to fix it, however, I now have the same problem, fix 1 doesn’t work, fix 2 doesn’t work as those keys are not showing in the registry.